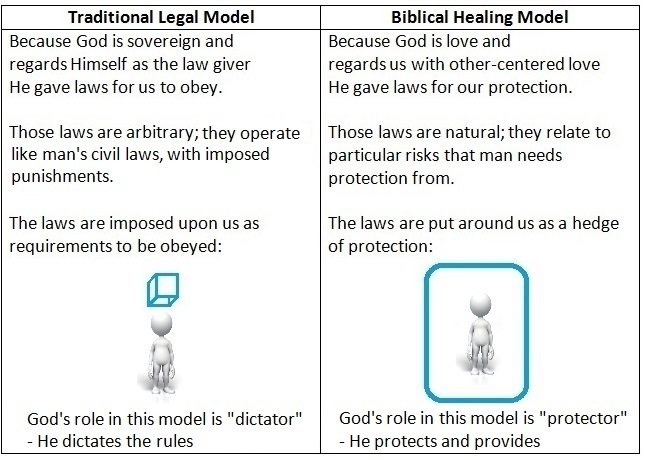 Traditional Legal Model – God’s law is the rules He made to govern our behavior which, if transgressed, incur the legal penalty of death (Rom 6:23). 1. God’s law is the design template for life and is based on love, the defining characteristic of God, (“God is love” – 1 John 4:8) deviations from which, if not corrected, naturally end in death. 2. Specific laws were given as diagnostic tools (“By the law is the knowledge of sin” – Rom 3:20) to show man his condition – whether or not he is in harmony with God’s law/principal of love. Is it “Law” or “The Law”? Especially in Paul’s letter to the Romans, where there is much discussion about law, the absence or presence of the definite article “the” with “law” is significant. In Romans, “law” is used about 35 times with the article and about 40 times without. One needs to check an interlinear version or consult a good commentary to determine whether the definite article is present or not in the original Greek because various Bible versions will add or omit it incorrectly. When the article is present, it is speaking more often of law as a code of conduct or of particular laws (as in the second definition above under Biblical Healing Model). In the verse above, “the law” can readily be understood to be a reference to the written law as it is used to distinguish a people to whom it as given as opposed to others who shared the faith of Abraham but were not his descendants. The challenge is to determine whether it is present or absent in the original Greek as various translations often are not consistent in including or excluding the article as used in the original. Even knowing whether the article is present or not, sometimes the context must be carefully considered to make the distinction. God’s law (principle) of other-centered love is not arbitrary. Death is the inherent result/natural consequence of self-centeredness which is a state of separation from God. Therefore, death is not a legal penalty, for the law simply declares reality. If uncorrected, a state of sin – living outside the law – results in final separation from God (Who is the source of life) and results in death. “The wages of sin is death …” (Rom 6:23). More verses saying this. God’s laws regarding behavior can be understood as diagnostic tools. A hurtful act such as stealing shows a person to be self-centered rather than other-centered. Attempting to keep all the laws regarding behavior (while good) can never save (legalism does not work) because behavior is not the problem. The heart must be changed to be in harmony with the principle of other-centered love. Can Divine Laws be Changed? There are many examples of what have been termed divine accommodation. A more thorough explanation of the role of divine law is given in this video. A Wall of Protection (56 min) – the real role of God’s law. In the Traditional Legal Model, God, being sovereign, can make whatever laws He chooses and arbitrarily attach penalties for disobedience to them. This is opposed to God’s laws being consequential. Read a guest article with good examples of and discussion regarding arbitrary laws. God makes laws according to His nature and how He has designed creation to function. He does not assign arbitrary penalties for disobedience but there are natural consequences for transgression. Those consequences apply to what we call natural law (gravity etc) but also to any breaking of God’s law of love (acting selfishly) which ultimately leads, if uncorrected, to separation from God and thus death. Legalism noun – 1. strict adherence, or the principle of strict adherence, to law or prescription, especially to the letter rather than the spirit. 1. the doctrine that salvation is gained through good works. The source adds that the word was first used in about 1830-40 explaining why it does not appear in Webster’s 1828 dictionary. Legalism, the belief one can be saved by obeying laws meant only to regulate behavior and show the condition of the heart, was well-demonstrated by the Pharisees of Jesus’ day. Well done Ray, you covered a lot of territory but made it easy to understand. If only people would study the history of these things, it would help them to see why things are the way they are and how wrong our understanding is.